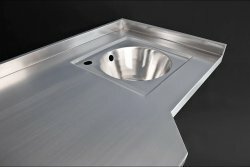 Our stainless-steel recessed vanity sinks are fully customisable, to provide the solution you need for your washroom. 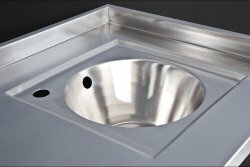 Whether you require a row of sinks for a public lavatory or a hand-wash basin built into a vanity top for a hospital, clinic or care home, we can fabricate the exact item, to your specifications. The hand-wash bowl is recessed as standard, to limit splash. The premium 304-grade steel is fully welded throughout, eliminating the bacteria-trapping seams that occur with other materials – making stainless steel the most hygienic option available. This metal is also exceedingly robust – the counter tops will outlast all other materials and are highly robust and impact resistant. Our vanity tops are fabricated to order in our Nottingham factory, allowing us the flexibility to provide the exact product you need for your clinic, hospital, GPs’ surgery or care home. We use only the highest-quality, 304, food-grade steel, which meets all current Health & Safety regulations. This metal is the most hygienic option on the market: its smooth surface naturally inhibits the adhesion of bacteria, helping to maintain the supreme hygiene standards required in your institution. In addition, our steel counter tops will last for decades – outlasting even Trespa, and making them the financially-sound choice for your project. simple, frame-style legs or under-sink storage, such as shelving or cupboards. Whatever your requirements, we can satisfy them. We also offer a large range of additional products for the healthcare sector, including examination and surgical tables; trolleys; lockable cabinets; shelving; shower trays and plaster sinks. Contact us today, to find out more. Our robust vanity tops are the ultimate washroom solution, allowing several people to wash their hands simultaneously, and avoiding the need to install multiple units. The fully-welded joins mean there is no ‘collection point’ for limescale and bacteria, keeping cleaning to a minimum, whilst helping to maintain maximum levels of hygiene. 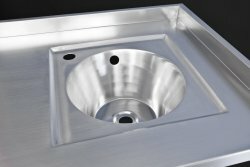 Fabricated from 304, food-grade steel, these quality products will last for decades, outlasting both resin and Trespa vanity tops – thus proving the economically-viable option for your washroom. Each of our washroom units is made to order. simple, frame-style legs or underbuilt storage (lockable, if required), for cleaning materials. 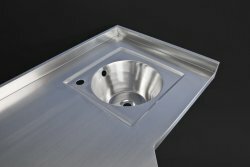 We also supply vandal-proof security sinks, for areas of high vandalism. Take a look at our other washroom products: we fabricate shower trays, urinals and slop hoppers/sluice sinks, all fully customisable to your requirements. Contact us today, to discuss your project.